Paint Us A Picture, a 2-year-old colt racing in Queensland, Australia, is making quite a name for himself, and it's for more than just his racing ability. 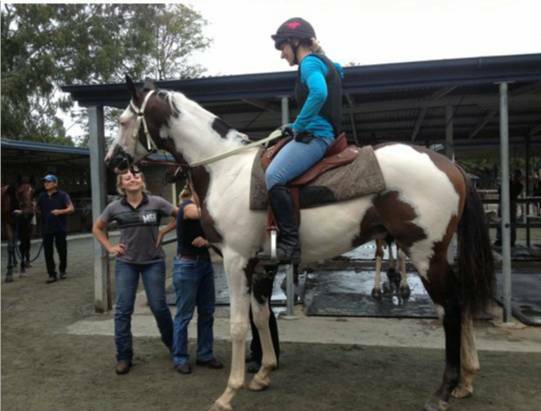 The colt, like Germany's Silvery Moon, is a rare overo Thoroughbred that was bred by Winning Colours Farm in Queensland. The colt won his first start, a 970 meter (4 furlongs 180 yards) barrier trial, on Oct. 8 at Callaghan Park. Paint Us A Picture is by the stallion Profile in Style out of Coldstream Candy, by Thameen. Both Profile in Style and Thameen were bred in the U.S., and you can find such notables as Halo, Secretariat, and Roberto in their pedigrees. Paint Us A Picture is trained in Queensland by John Pointon. This entry was posted in Racing and tagged Australian racing, Horse Racing, paint us a picture, profile in style, queensland racing, thoroughbred, winning colours farm by Paulick Report Staff. Bookmark the permalink.